Home » Blog » SPONSORED POSTS » REVIEWS » PRODUCTS » SOOTHEZE IS BEAR-Y, BEAR-Y GOOD! SOOTHEZE IS BEAR-Y, BEAR-Y GOOD! We have a new addition to our household. No, it’s not another baby (at least, I hope not yet!) Mom has a new friend! A couple of weeks ago I got the opportunity to order her a Sootheze Toasty Stacey Bear to review for you! 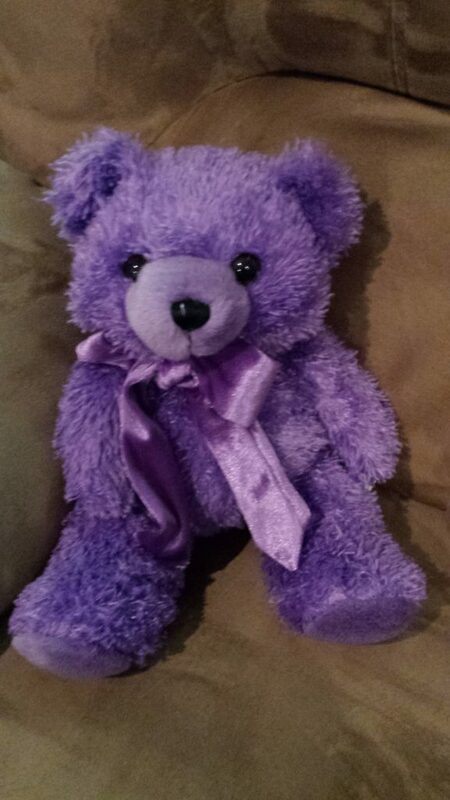 I went online and picked out a purple bear that I was sure my mom would love. They had all kinds of designs to choose from. As soon as I took it out of the box she started squealing with joy. She loves stuffed animals and porcelain dolls so I knew it would be huge success around here. It’s not just pretty though it pure genius! It’s not just a “teddy bear”. It’s called “Sootheze” for a reason. It does a lot for just a little bear. You can use it to enjoy awesome heat therapy by putting it in the microwave for a very short time. I was surprised how long it stayed warm! You can also use it for cold therapy as well, by sticking it in the freezer for a minimum of 2 hours. Either way you use it, can give you hours of relief for sore aching bones or muscles. The best part though is inside the bear. There is a special blend of herbs selected especially to sooth, calm and comfort. It works because mom loves the fragrance. It contains lavender, thyme, peppermint, rose bud, Hyssop, eucalyptus, lemon balm, rosemary, orange peel and flax seed. Their tagline is “Soothing comfort for the body and mind“! It’s so true. I was surprised that something so small could have such a huge effect on her. Just seeing it makes her smile but when she smells the fragrance the smile reaches her eyes! That fragrance takes her back and that always makes her happy. These are perfect for people suffering for Alzheimer’s and Dementia, but I think they would also be perfect for children. I’m going to order a couple for my grandchildren now that I see what a huge hit they have been with mom! « P & G HELPS TO REDEFINE LAUNDRY! Hey I might order it for me! I’ve used it Pia! No shame here haha! It great for heat therapy. It is Liv! My mom loves it! That’s downright precious. Thinking of people I could gift it to. It is so awesome Carol. Whether it’s heat therapy or cold…or both this little guy does it all and the fragrance is out of this world! That is a great idea. I know with my Mother they have baby dolls and stuffed animals for the women to hold in the dementia wing. A warm one, would be a big hit. It would be Haralee! My mom loves her’s! I love it Carolann! We love it! Thank you for sharing. I will definitely check it out! Thanks Sharon! I hope you enjoy it! It sounds like every household should have one! What a great idea – and so glad that it has been helpful to your mom! How wonderful. May it continue to provide her with comfort. Off to share. Kelly L McKenzie recently posted…My First Job? Next Slide, Please. She loves it! It sits on her bed every single day! I love teddy bears. I might have to get one. I received a bear at a bereaved parents conference we attended, he was just what I needed. He actually sits with me at my desk. I think these are a wonderful idea. Love the purple. So glad he is bringing your mom some joyful moments. Wishing you a peaceful evening.